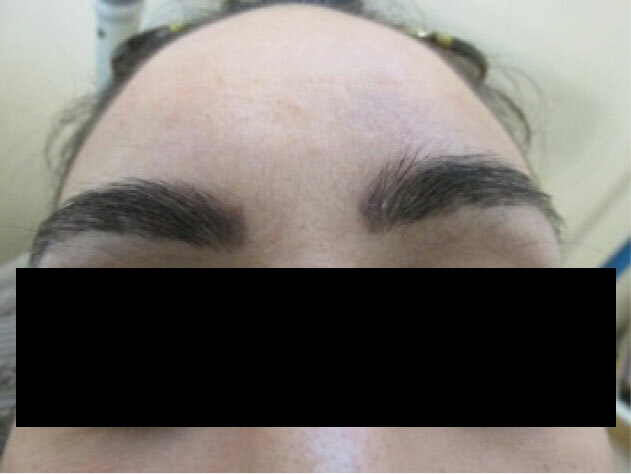 I am writing this article in response to the hundreds and hundreds of women and men that have contacted me expressing their dissatisfaction with the way their brows turned out regardless of the technique that was used. 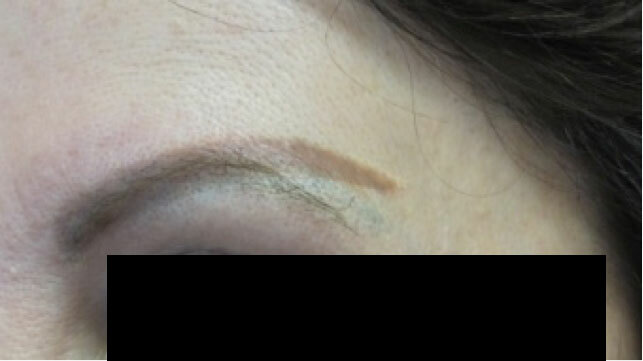 In my twenty years of doing permanent makeup I never dreamed that a large part of my business would be removing it. For technicians that are reading this, there are many that do very nice work. 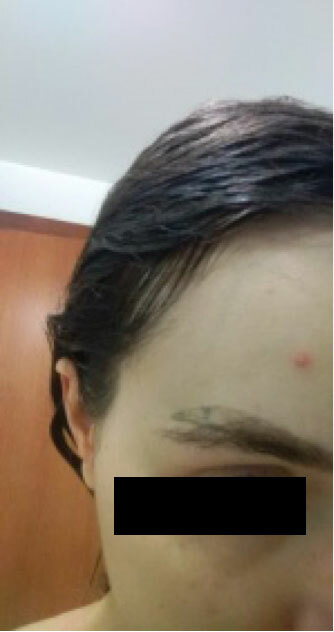 I receive emails from all over the world (Europe, Brazil, South Africa, Israel, Australia, Middle East, and across the US and Canada from people who have had micro-blading and are in a lot of emotional pain because their work is either too close, too square, too big , too arched and too far outside of the hair line and too dark. They are depressed and they say that they look like an angry bird and it has affected their self-esteem. There was a time that they contacted me a month after their work. Now they are contacting me the day of and the day after their work. They are taking things into their own hands and reading on the internet on how to remove the pigment with baking soda, peroxide, salt scrubs and Listerine!! See picture below. They are rubbing so hard that they are damaging their skin and burning it. They see pigment coming out, but that would have probably exfoliated anyway. Or they rub down to the dermis of the skin and can cause scar tissue. There is a cookie cutter design (close to the nose, square, too wide and too arched) that is being taught that isn’t for everyone. And it is the blind leading the blind because a new student who thinks they have mastered the technique thinks they can teach others and make a lot of money and a lot of clients are the victims. I receive pictures from these women and men on a daily basis looking for help. 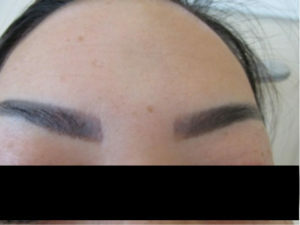 Technicians are not thinking outside the box as to what style of brow is good for each individual. The shape of the face has everything to do with how close or separated the fronts are and whether they need a straighter or more arched brow. And most important, does that person really need anything at all. 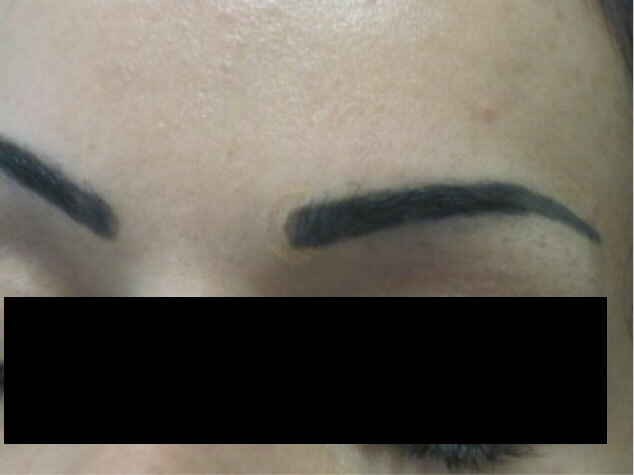 If someone already has a great brow, shape it properly and don’t tattoo or help them grow out their brow if they have over-tweezed or shaved their brows. (see when not to tattoo). One of the biggest problems that I see is coming out in front of the real brow in an attempt to make it come off the bridge of the nose. What happens here is that the tattooing is flat and the brow hair is dimensional and it draws attention to the fact that it is not real. The strokes often widen and can change color. 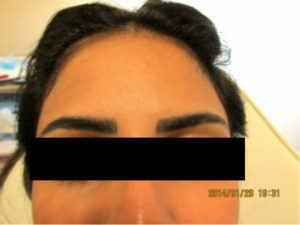 If someone already has a soft, light and airy front, it should be left alone and started further back into the brow if that is needed. I have hundreds of pictures like these. Sometimes the strokes hold but very often they break up and the pigment migrates outside of the hair stroke. Strokes are now gray and blending together. They draw attention to the fact that they are not real hair. Technicians are misinterpreting the vertical real hair in front as square. With a real brow, one front is more vertical and the other side usually is more rounded and bends. The fronts are the most challenging and must be well thought out to do or not to do. 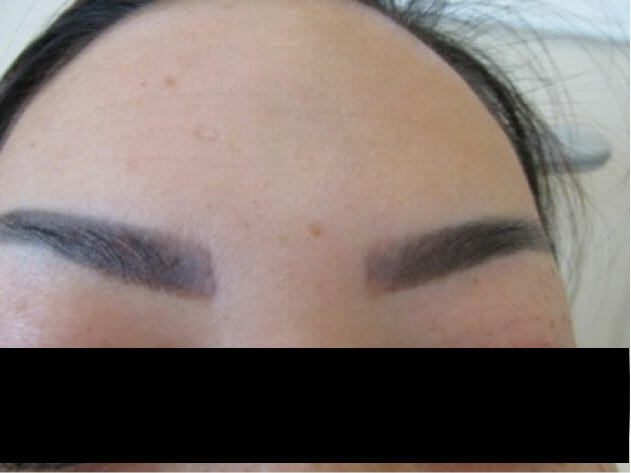 The top picture is her brow before. 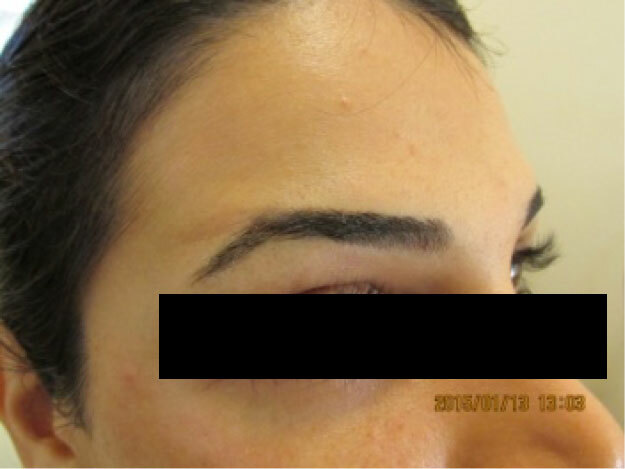 The Second is right after micro-blading and the last is the healed result. Strokes did not hold and they went in front of her real hair. Not everyone is meant to have their brow come off the bridge of the nose. The shape of the face is instrumental in that decision as well as where her own brow begins. Picture on left below. The old tattoo was much too high. 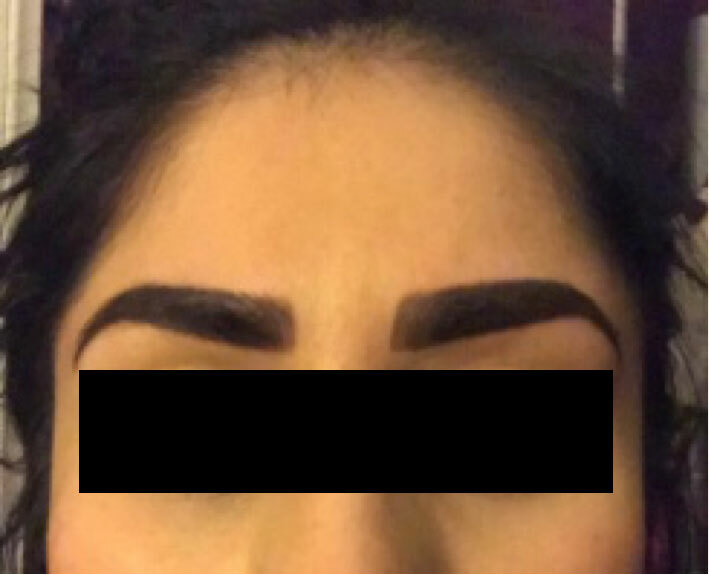 Her own brow grew in. Removal was done one more time after this picture. Picture on right below. 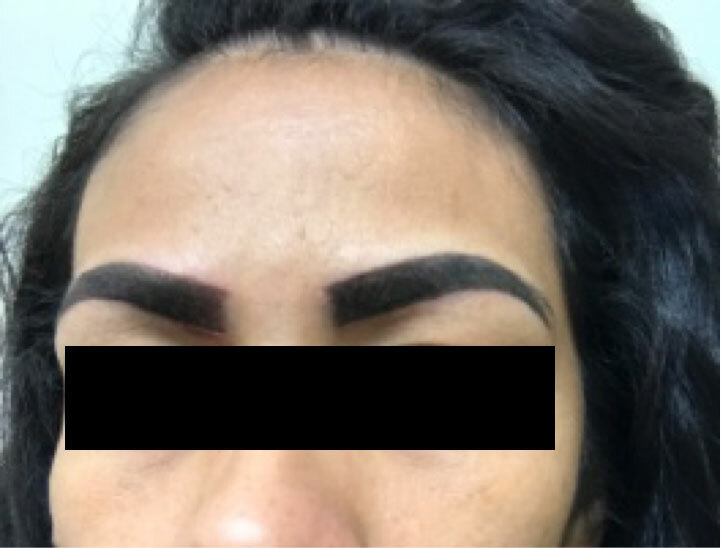 Her own brow grew in. She naturally has a straight brow. 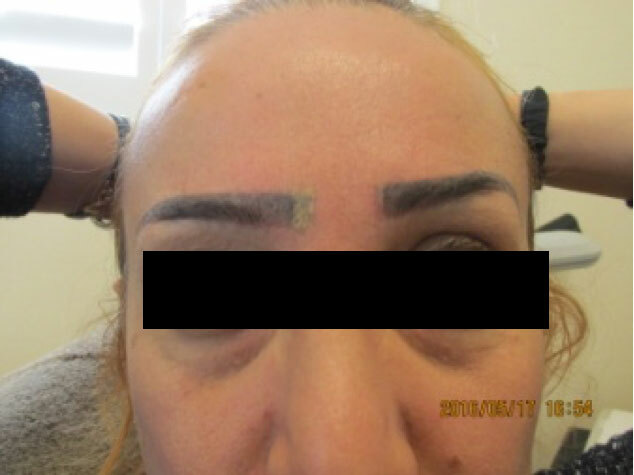 The tattooed brow is too high and was not necessary. 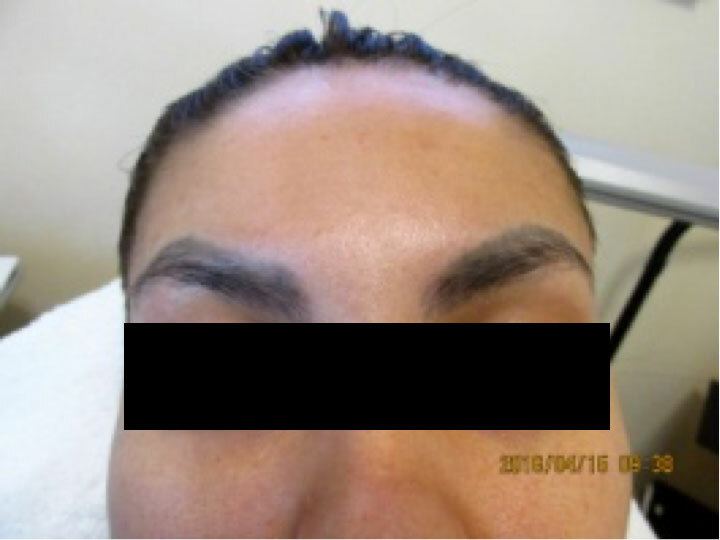 I also see brows being partially shaved to create a new shape!! 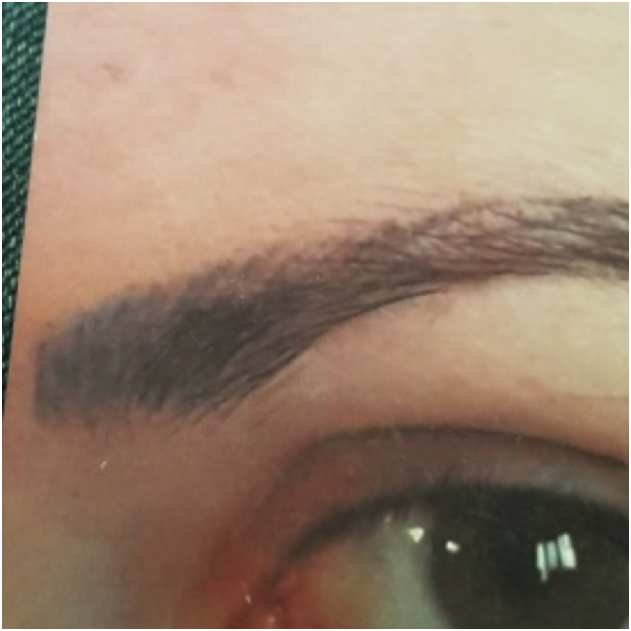 No matter what method is used for hair strokes, more often than not they break up and become a shaded brow (sometimes blotchy and multiple colors ) and we cannot get the strokes back in again (unless the pigment fades away) because we need the virgin skin to be the background so the color implanted can appear to be the foreground. Sometimes the strokes hold but very often they break up and the pigment migrates between the hair stroke. Ombre (shaded) brows are lovely but once again must suit the persons face and not be too close, too big, too arched or too dark. The fronts must be very soft. A substantial brow with a nice arch is fine, but I have hundreds of pictures where people look too severe. And the client must know that all tattooing can change color. We always hope it will fade to a lesser color of itself, but it doesn’t always do that. This applies to all techniques. Those technician’s who have been doing this for a long time, know what I’m saying. What I seem to remove the most are the fronts, width and arches. 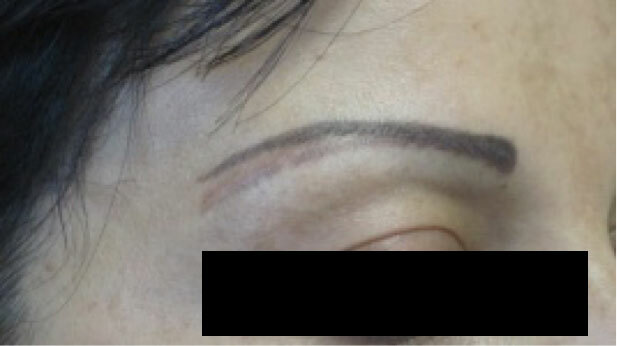 Rather than taking out the entire brow, I try to salvage it by sculpting around the brow and leave them with a better shaped brow that is more proportionate to their face. When it is just too dark then we lighten it, but in doing that it can change color to the most dominant color that was in the pigment (red, orange, blue, mauve, gray, green or become a lighter version of itself. These changes can occur anyway as they just lighten naturally. We always hope they will lighten to a lesser color of itself, but it doesn’t always do that. I never use camouflage colors to cover up a mistake. That is covering up a mistake with a mistake. Trying to change a really dark color to a lighter color with a correction color doesn’t work. In no time the darker color prevails. Or when you go out into the sunlight the correction color becomes visible. Lighter colors can be color corrected. 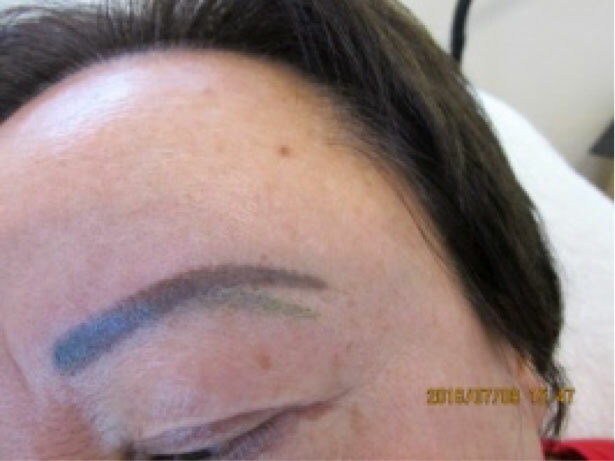 Some technicians cover with flesh tone and then tattoo over the flesh tone with a brow color, but my personal opinion is to remove/lighten the culprit in the first place. If you have one tail and don’t like it and then want it in a different place, take out the one you don’t like first before you add another, but don’t cover it up with a flesh tone. You will almost always see the flesh tone down stream and it can change color. See this example of how the flesh tone is yellow covering the gray . Not good. She has 3 tails. Each a different color. 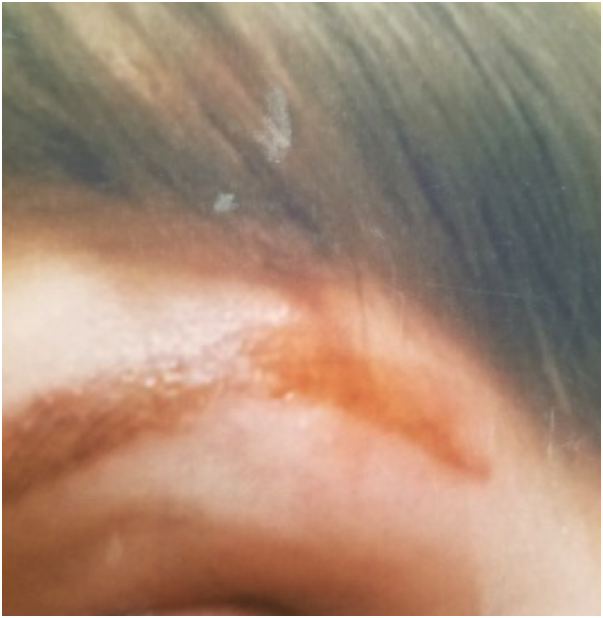 The front was covered up with flesh tone pigment. 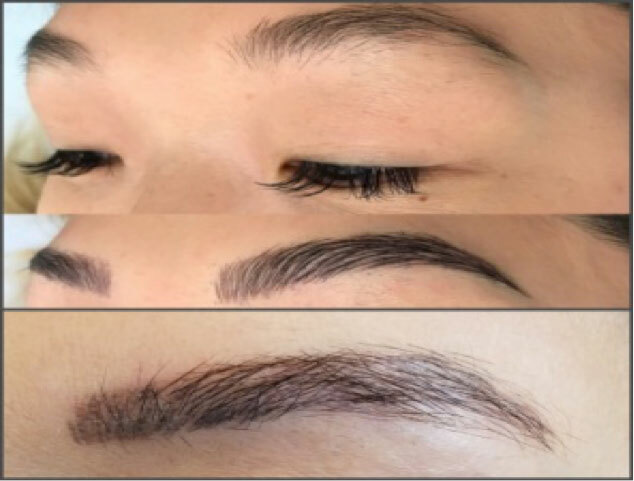 Please refer to” permanent makeup removal” for more information on how to achieve lightening or removal of permanent makeup/micro-blading, eyeliner, lip liner and small body tattoos.